All the steps of the photographic process, from the development and the printing of the negative to the mounting of the Fine Art print and the making of the matt board and the passepartout, are performed by myself in my studio. The final aspect of a Fine Art print is an issue of no secondary importance: it must be considered as the conclusive basic step and we have to pay to it the same attention we pay to the other steps. Beside the aesthetic aspect, we have to bear in mind that the mounting of the print has a deep connection with the issues of protection and good preservation. 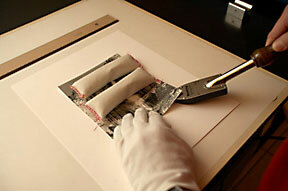 There are several ways to mount a Fine Art print. Some of the greatest photographers like Ansel Adams, Edward Weston, Brett Weston and today John Sexton adopted the “dry mounting” technique. I saw John Sexton use this technique in his Carmel Valley, California studio and I decided to adopt it myself for my prints. By this method, thanks to a special glue in sheets that is warmed in a press, the print is joined to the matt board with perfect flatness. The print is completely even and this technique prevents the formation of folds, bubbles and imperfections. In addition, the print is permanently fixed to the matt board, and all the information about the print enlisted on the back side of the matt board, and also the signature that lies on the front side at the bottom of the print, can no longer be separated from the print itself. The print is fixed to the matt board. The thermoplastic sheet used to join the print to the matt board permanently isolates one side of the print (the back side, opposite to the emulsion) protecting it from the aggression of the polluting substances in the atmosphere that in time end up with damaging the print. This aspect, already analysed by Ansel Adams, has been further investigated by Professor Douglas Nishimura of the Image Permanence Institute of Rochester Institute of Technology, whose studies demonstrate that, besides the development and the chemical treatment, also the storage conditions may affect the silver emulsions. For instance, there is evidence that substances coming from carpets or from photocopiers cause serious damage to silver prints. The crucial point of the dry mounting technique is that it´s a non-reversible system. Once the print has been fixed to the matt board, they are going to be together forever. So if the matt board is damaged or the print needs restoration, it is almost impossible to separate the two elements without damaging them. For this reason it is fundamental that the matt board is an “archival” one, that is, Acid-free, Lignin-free, and buffered with calcium carbonate at a pH between 8 and 8.5 in order to guarantee an alkaline environment. 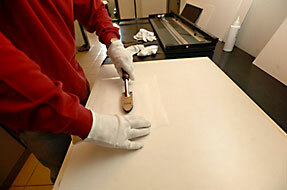 Matt board and print are inserted in the press for the final mounting. The cardboards I use in my studio for the making of the matt boards and the passepartout have these characteristics: they are 4-ply, Acid-free and Lignin-free, buffered with calcium carbonate at a pH of 8 – 8.5. They are 100% cotton fibre and match the P.A.T., Photographic Activity Test, in compliance with the American National Standards Institute and the International Standards Organization. The matt board and the passepartout are joined by an Acid-free and pH neutral linen adhesive tape. The framing requires a frame and archival materials in conformity with the international archival standards. 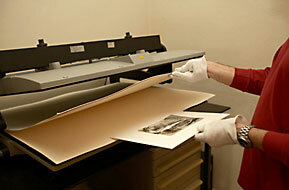 The dry mounting system guarantees that the information on the print and the signature can never be separated. In the stamp I put on the back of my prints – always in sight thanks to an aperture in the matt board – beside my name and copyright, are listed the following information: the title of the print, the year the negative was exposed, the year the print was made, the file number of the negative and of the print (so that I can always trace back the characteristics of both) and the assessment that it is an archival and signed gelatin silver print. Moreover, when I sell a print, I enclose a document where I give further information: the photographic gear used, the type of film, the type of paper, the development system, the type of board and thermoplastic sheet used.